Martin Wolfer competing four years ago in this same event. Back on May 5, our European representative, CRR Martin Wolfer, competed in a rather unique cross-country relay in the Switzerland—the SOLA-Stafette, a favorite of his near where he lives that he has run annually for several decades. His team finished 11th of 944 relay teams. He provided the details below. Here are his explanation of the race and the results for his team. “The name of the race is ‘SOLA-Stafette.’ The name SOLA (‘sun’) originates in Sweden, where in 1967 they organized a relay with that name, from Göteborg to Karlstadt. In Zürich, it was held for the first time in 1972. I [first] participated in 1978…. I [have now] started 36 times in this event. 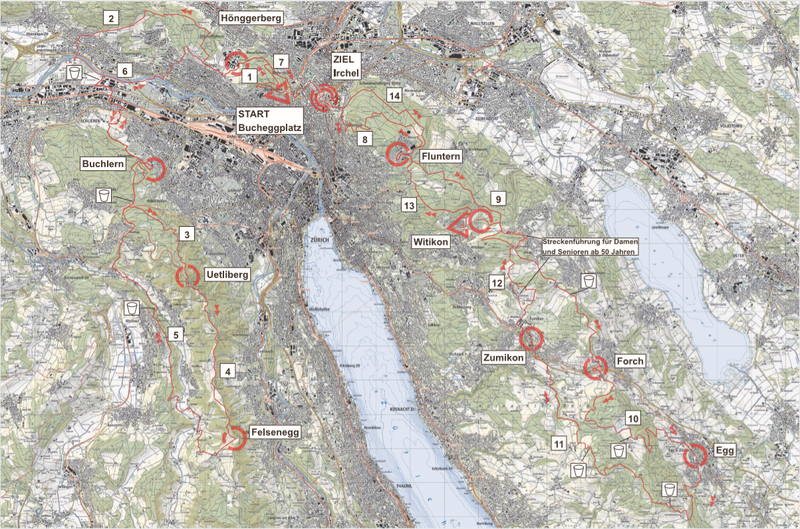 “In the [map below], you see that the race is located around Zürich [the city at the head of the lake]. The changing points are chosen such that they can be easily reached by public transportation. The overall distance is 114 km, split into 14 [unequal and non-conventional distance] legs. 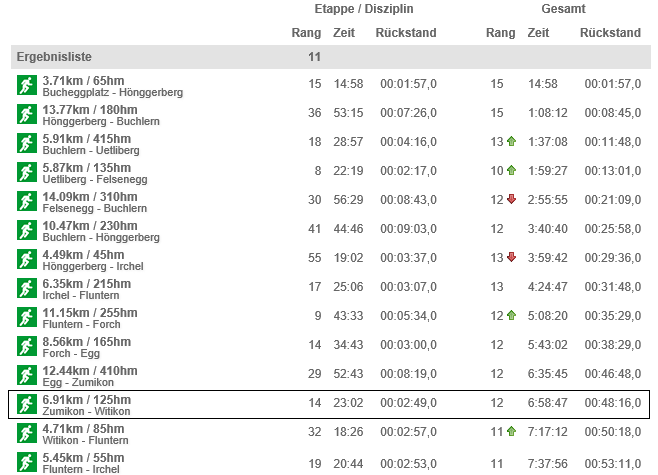 “The first column (‘Rang’) shows the individual rank, with ‘Zeit’ [being] the time and ‘Rückstand’ the time behind the best runner on that particular leg. Martin ran 23:02 for his leg, which equates to a 19:45 cross-country 5K. Pretty complicated relay, but it’s clear that Wolfer, who had held Delaware resident age-group records in both the 5K and the marathon back in the late 1980s (when he trained here on Creek Road), is still enjoying the sport and running strong. 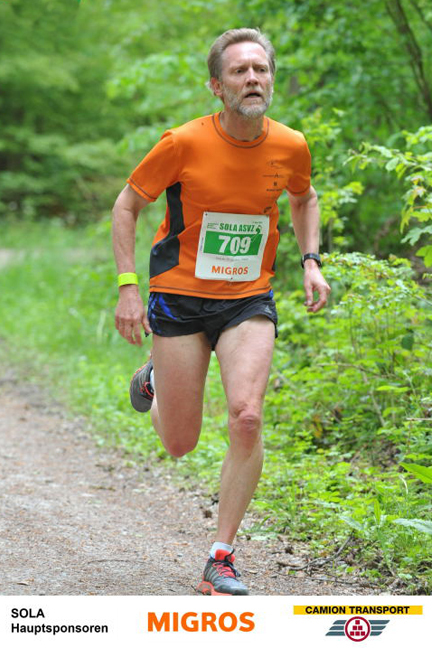 If you think the 4-person relay at the Delaware Marathon Running Festival was long, tough, and crowded, take a look at another kind of racing a Creek Road Runner is doing in Switzerland (also see the recent exploits of CRR Paul Amer). The race is held around Zürich, mostly on the hilly parts along the Lake of Zürich. All relay transition areas are easily reachable by public transport, so no one needs a car. “This is a necessity,” Wolfer says, “because this year about 900 teams took part and the roads couldn’t take the traffic.” Participants are mainly students or alumni of either of the two universities. This was Wolfer’s 32nd time running in this relay. He finished 6th fastest in his division, and his team came in 17th overall. 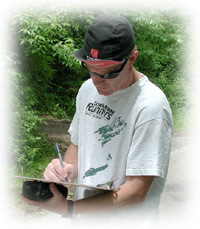 Wolfer trained on Creek Road back in the late 1980s while a post-doc in chemical engineering at the University of Delaware. A superior competitor, by the time he had returned to Switzerland, Wolfer held the Delaware resident age-group (25-29) records in both the 5k and the marathon! Those records have since been broken, though they held up for 20 and 16 years, respectively. In 1988 he helped the Creek Road Runners team comprising seven University of Delaware runners place second overall in the silver anniversary edition of the Caesar Rodney Half Marathon.